The collapse of MG Rover on 8th April 2005 was a major event and had very wide implications. At this time MG Rover were in the final stages of a collaborative deal with Shanghai Automobile Industrial Corporation (SAIC) of China, and shortly prior to the collapse SAIC had bought the rights to most of the MG Rover cars and K series engines. In July 2005 Nanjing Automobile Corporation (NAC) of China bought the bulk of the remaining assets of MG Rover from the Administrators. 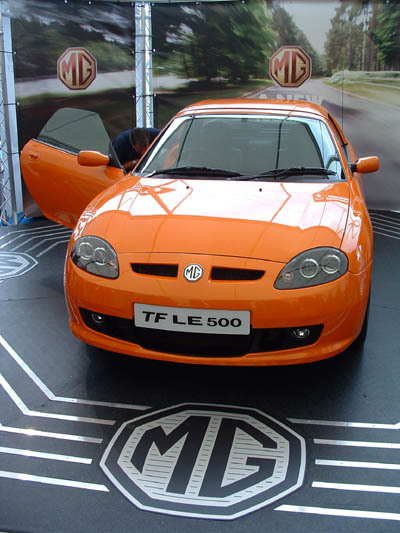 In May 2007 they held a re-launch of a lightly altered MG TF at the Longbridge factory. Shortly after it was announced that NAC was in detailed discussion with its rival SAIC related to a 'merger' of the two companies. The merging of the two companies made sense as they were both initially developing and building their own versions of the former MGs and Rovers. The merger talks then delayed the appearance of the TF in showrooms until the merger was completed and SAIC, the dominant partner completed a review of the TF. The UK Company also saw a name change to MG Motor UK Ltd.
August 2008 saw series production of the TF for customers start at Longbridge and deliveries started in September 2008. The initial model was the very well specified MG TF LE500. This as the title indicates was a limited run of 500 cars with an extensive range of standard equipment that included air conditioning, body coloured hard top, full leather seating and rear parking sensors. The MG TF LE500 was initially priced at £16,399, on the road, which included all taxes, but when the VAT rate was reduced this fell to £16,055. The choice of exterior colours extended to six colours titled Intense Blue (metallic), Crystal White (pearl), Graphite Grey (mica-tallic), Raven Black, Scorched Red and Vibrant Orange (pearl). Most early publicity images of the TF LE500 used cars in the orange colour. The suspension was the much softer riding specification carried over from the very last few MG Rover MG TFs, significantly more comfortable than the majority of previous TFs. Wheels were carried over 11 spoke 16", previously associated with the MG Rover TF 160 models and all models used the same models large 304mm diameter front brakes with distinctive and very effective red four piston AP Racing callipers. Tyres were also carried over with Goodyear Eagle F1 in the correct GSD2 format. Following the LE500 models in April 2009 MG Motor announced two further TF models for the UK market to be available during the summer of 2009. One was the new base specification TF 135, mechanically identical to the LE500, but with a base level specification and a much lower starting price of £13,511 on the road. The base specification was not so base for the first 110 cars as they came with 'free' leather seats, the same as on the LE500. These first cars also came with a new wheel, still the same 7"x 16" as other models, but with a V spoke style, very similar to the last MG Rover TF 135 models. The difference though is that the MG Rover wheels came only in 15" diameter and these new wheels are 16" diameter and also have plenty of clearance for the big AP Racing front brake callipers and 304mm diameter discs. Following the first 110 TF 135 base models the specification of these cars changed with cloth seats in place of leather and the V spoke wheels being replaced with the 11 spoke 16" wheels as used on the LE500 models. The body colour options for the TF 135 models extended to eight colours, Racing Green (metallic), Radiant Red (pearl), Raven Black, Oceana Blue (mica-tallic), Storm Grey (metallic), Frost White and Mellow Yellow. Only green, red and black colours being available initially. To celebrate the 85th Anniversary of MG, a limited run of special models was created. The TF 135 mechanical package was the basis for this model but with some specific changes to the suspension. This involved the use of unique Bilstein dampers, thicker Eibach front and rear anti roll bars allied to uprated links and front lower arms, plus a lowered ride height. There are also new wheels with as a first for any TF before different wheel sizes between the front and rear axles. Up to this time only tyre sizes differed but with the 85th Anniversary cars the front wheels are sized 6.5"x 16" and the rear wheels are sized 7.5" x16". Tyres are the same 195/45x16 front and 215/40x16 rear Goodyear Eagle F1 GSD2's as before. The design of the new wheels is also completely new with a 'Twisted Pepper' design, finished in a shadow chrome type of finish. Rimstock in the UK made the wheels. Outside there are three body colour options, Intense Cassis, an aubergine colour, Enigmatic Silver and Ice White. Each car has a double stripe offset to the left side of the car running from the front, up over the bonnet and then across the boot and rear bumper. In addition there are side graphics to each door including an 85 in an octagon. The double stripes are of unequal widths, and all the graphics are in a contrasting colour to the body colour. Inside is themed with aubergine leather for the seats and door car inserts with other individual touches including monogrammed sill plates, special alloy gear knob and quality ICE. Unlike the other MG Motor TF models the 85th Anniversary model displays a noticeable improvement to the ride and handling with both aspects being changed for the better. The ride of the standard MG Motor TF 135 is markedly improved over all but the last 630 or so MG Rover TFs, and the 85th Anniversary model takes this improvement to a new level, yet also shows a quite noticeable improvement in the cars already good handling. Mechanically all cars used a Chinese manufactured 1796cc N series engine, a development of the original Rover K series engine previously fitted, but now made in China and updated to be EU4 compliant. A single power specification applied with 135ps power and 165Nm torque, which was mated to a PG1 5 speed manual gearbox, essentially identical to the previous MG Rover PG1 gearbox, but again now made in China.